At TBG we believe that leadership is everyone’s business and not just the preserve of a few who are ‘born’ to it. 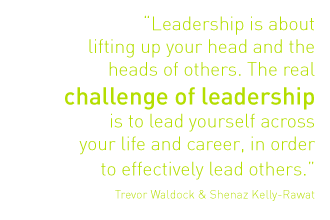 At all levels in our work we see examples of leadership making a difference or leadership potential successfully developing. However this experience is also countered by the persistent myth, which does appear to limit people’s ambition – that is: leadership cannot be learned. We believe that everyone has the potential to become a more effective leader of themselves and others. The ever relentless pace of change, the complexity and uncertainty surrounding many issues, the constant pressure this brings, now requires leaders at all levels to both recognise and respond to these challenges confronting their organisations and the wider community. The Challenges Approach to Leadership3 (see ‘Leadership’ in Resources section) has helped TBG to focus our approach to leadership development by asking individuals, teams and organisations to start by recognising and understanding the challenges they face and identifying what resources in the broadest sense need mobilising to tackle them, then exploring and understanding the specific, and possibly unique context in which they are operating, and finally, developing the individual or collective qualities, competences and skills needed to address those challenges. The key aspects of this approach for TBG are that personal development, in and of it’s self, may not be sufficient, the context domain is generally neglected in leadership development initiatives, and there is no one right way to take action in confronting the challenges we face. There are many examples to illustrate this from Marks & Spencer, BP, football team managers and CEOs in the NHS – who are successful in one context facing certain challenges, but when they move to another context with different challenges, they do not appear to be as successful or even fail. So if successful leaders in one context can fail in another it’s pointless looking for a one size fits all leadership model. Being an effective leader requires a constant combination of taking action on real challenges, working productively with people, searching out feedback on your impact and performance, reflecting and learning from these experiences and continuing with further action and development. Effective leaders come to know themselves through the purposeful use of psychometric instruments, gathering data through individual and wider 360 feedback, having role models, working with coaches and mentors, and taking risks. Through these processes they are continuously developing their self awareness, their emotional intelligence, their resilience, and their confidence. They think strategically and thoughtfully planning their actions rather than being drawn into simple reactions which can be emotionally driven – they always know that there are choices. At TBG we believe that it is pointless looking for ‘the’ leadership model – leadership is not mechanical it is a performing art. Instead we encourage our clients to tap into the knowledge and insights provided by a wide range of thinkers and practitioners to develop a leadership style that fits the current challenges they face and the context they are operating in but is constantly under review to meet the inevitable changes that come along. Given the motivation and desire leadership skills can be strengthened, honed, and enhanced through practice, feedback and planned development.